Check the hose connections and if necessary connect a Vacuum Gauge directly to the vacuum pump to test. Why is it necessary to change the oil in my HVAC/R Vacuum Pump? Because vacuum pumps don’t have filters, the oil inside becomes saturated with contaminants, which reduces the pump’s efficiency. As any moisture is absorbed by the oil, more contaminants are added however any moisture can boil off, contaminants cannot. Maintaining clean oil in the pump ensures that the pump will obtain ultimate vacuum and will last for a long time. Can I use any oil in my vacuum pump? HVAC Vacuum pump oil is a specialist mineral oil that is formulated without additives resulting in a higher vacuum and an oil that absorbs moisture and containmentants. Your vacuum pump oil should be clear that will alert you to contamination sooner as it becomes cloudy, milky, or discoloured. Why is it important to change my oil when the pump is hot? The moisture and contaminants start to separate in the pump at lower temperatures then the contaminants cling to the walls of the pump when drained. When you refill the pump with new oil, those contaminants will mix with the new oil contaminating it. Why does the micron gauge slowly fall back and then start to hold after pulling a vacuum and blanking-off? The reason for this is there is equalization within the system. If you pull a vacuum lower, it will then fall back at a shorter range and hold. Depending on the size of the system ten minutes is long enough. Why do you need to check the oil level when the pump is running? If the vacuum is not broken before pumps are shut down the oil in the cover will seek the vacuum out within the pump assembly. Then the oil level will drop in the sight glass and while still being the correct amount of oil. If the pump is refilled to the oil level line and then the pump is started, the oil that got sucked back into the cartridge and intake chamber will be kicked back into the cover and now you’ll be overfilled, and the oil will shoot out the exhaust. Also, potentially causing your pump damage. If I am always pulling a vacuum on clean, dry systems, is there a way to check my oil in the pump to see if it is contaminated and not have to change it so frequently? Attach a micron gauge directly to the pump and you should pull to 50 microns or lower. If the micron gauge does not pull to 50 microns, it is an indication that the oil should be changed. Other than pulling air out of the system, how does my vacuum pump get rid of the moisture in the system? All two stage vacuum pumps should pull enough vacuum to reduce the atmospheric pressure within the system, therefore all moisture should boil off at a lower temperature. Once the moisture is in a vapor form it can be easily removed by the pump. What is a gas ballast and how do I use it? If the vacuum pump is displacing vapor that would condense in the pump at the corresponding temperatures without gas ballast, the gas ballast enables the outlet valve to open before the vapor condenses, and the vapor is discharged together with the ballast gas. 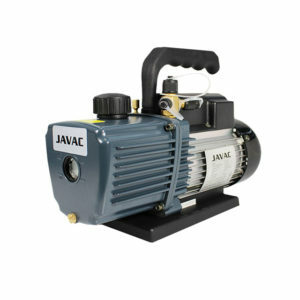 The use of gas ballast slightly increases the attainable base pressure of a vacuum pump. The gas ballast when open allowing the initial volume of air in the system to bypass the oil so as to not contaminate the oil immediately. If I use a larger vacuum pump, will I be able to pull down to vacuum on a system any faster? Using a vacuum pump on air conditioning systems from 1 ton to 10 tons, you will not see the difference between a 45 litre minute pump and a 280 litre minute pump. If you put a vacuum pump on a HVAC system and you notice within 3-5 minutes the vacuum pump gets quieter and you cannot really feel any air leaving the pump. At this point there is no more free air left in the system and you are now working with vacuum & molecules. At this point if you replaced a pump with a 10 CFM pump, there is no change in vacuum or time. Micron is a unit of measurement starting from a perfect vacuum at absolutely no pressure that is expressed in linear increments. One inch= 25,4000 microns thus one micron= 1/25,400 of an inch. In the micron vacuum scale, we start at 760,000 microns at sea level atmospheric pressure and work down towards a perfect vacuum of 0 microns or 0 hg. Therefore a lower number in the micron vacuum scale equals a lower vacuum and a higher number equals a higher deep vacuum. This shows why pulling a deep vacuum is done in microns, it is a very fine measurement that provides very detailed results. Therefore very small changes can make such a huge difference in the micron reading on a micron gauge. I have been using my low side gauge to measure a vacuum, is this right? No its wrong. The low side gauge knows only atmospheric pressure and cannot sense moisture or non condensables. A micron gauge is a heat sensing device that not only reads atmospheric pressure, but also measures the gases created by the vacuum pump as it boils the moisture. For example, if you were to pull a vacuum on a bottle of water the low side gauge when pulling a vacuum will read a perfect vacuum. Using a micron gauge, it will immediately tell you with a high reading the you have a problem in your system. You need a proper micron gauge. I have been trying to pull a vacuum on my system using a micron gauge and cannot get it down to a low reading. A possibility is that some oil may have entered the micron gauge and is giving false readings. The remedy is to pour regular rubbing alcohol into the connector on the micron gauge, shake, and pour out. Use the liquid alcohol only. Do this about three times to five times if required. I am able to pull a vacuum on my system, but when I blank-off, the micron gauge rises rapidly. Unless you are using copper tubing, or flexible metal hoses, it is not recommended to use your existing manifold and hoses for blanking-off a system to check for leaks. Vacuum is very critical in leaks, more so than pressure. All charging hoses permeate. Where the crimp is on the brass to the hose also has possible leak issues, and the gasket at the coupler is a major leak offender. The vacuum industry uses O-rings on most couplers. When using an O-ring, you screw down on it to get a metal to metal seat and the O-ring lies around the lip of the flare giving it a positive seal. Can I mount my micron gauge onto the vacuum pump? It is not recommended to do so as you are reading what the pump is doing and not what the pump is doing to the system, it is suggested that you tee off on the suction side of the system and mount the gauge there. How low of a vacuum should we pull on a system? HVACTOOLS recommends that a system be pulled to at least 250 microns and held at least five minutes. If any polyester oils are in a system, it is recommended to pull a much lower vacuum as moisture is very difficult to remove even with heat and vacuum.